Doctor of the Church. 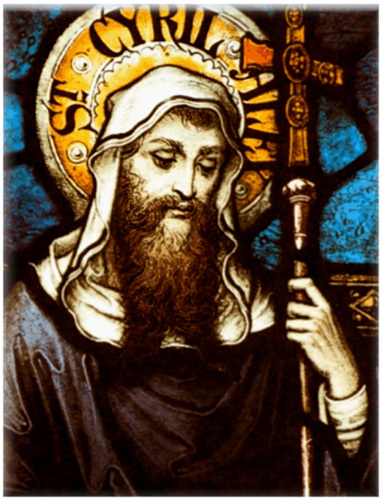 St. Cyril has his feast in the Western Church on the 28th of January; in the Greek Menaea it is found on the 9th of June, and (together with St. Athanasius) on the 18th of January. He seems to have been of an Alexandrian family and was the son of the brother of Theophilus, Patriarch of Alexandria; if he is the Cyril addressed by Isidore of Pelusium in Ep. xxv of Bk. I, he was for a time a monk. He accompanied Theophilus to Constantinople when that bishop held the "Synod of the Oak" in 402 and deposed St. John Chrysostom. Theophilus died 15 Oct., 412, and on the 18th Cyril was consecrated his uncle's successor, but only after a riot between his supporters and those of his rival Timotheus. Socrates complains bitterly that one of his first acts was to plunder and shut the churches of the Novatians. He also drove out of Alexandria the Jews, who had formed a flourishing community there since Alexander the Great. But they had caused tumults and had massacred the Christians, to defend whom Cyril himself assembled a mob. This may have been the only possible defence, since the Prefect of Egypt, Orestes, who was very angry at the expulsion of the Jews was also jealous of the power of Cyril, which certainly rivaled his own. Five hundred monks came down from Nitria to defend the patriarch. In a disturbance which arose, Orestes was wounded in the head by a stone thrown by a monk named Ammonius. The prefect had Ammonius tortured to death, and the young and fiery patriarch honoured his remains for a time as those of a martyr. The Alexandians were always riotous as we learn from Socrates (VII, vii) and from St. Cyril himself (Hom. for Easter, 419). In one of these riots, in 422, the prefect Callistus was killed, and in another was committed the murder of a female philosopher Hypatia, a highly-respected teacher of neo-Platoism, of advanced age and (it is said) many virtues. She was a friend of Orestes, and many believed that she prevented a reconciliation between the prefect and patriarch. A mob led by a lector, named Peter, dragged her to a church and tore her flesh with potsherds till she died. This brought great disgrace, says Socrates, on the Church of Alexandria and on its bishop; but a lector at Alexandria was not a cleric (Scr., V, xxii), and Socrates does not suggest that Cyril himself was to blame. Damascius, indeed, accuses him, but he is a late authority and a hater of Christians. Theophilus, the persecutor of Chrysostom, had not the privilege of communion with Rome from that saint's death, in 406, until his own. For some years Cyril also refused to insert the name of St. Chrysostom in the diptychs of his Church, in spite of the requests of Chrysostom's supplanter, Atticus. Later he seems to have yielded to the representations of his spiritual father, Isisdore of Pelusium (Isid., Ep. I, 370). Yet even after the Council of Ephesus that saint still found something to rebuke in him on this matter (Ep. I, 310). But at last Cyril seems to have long since been trusted by Rome. It was in the winter of 427-28 that the Antiochene Nestorius became Patriarch of Constantinople. His heretical teaching soon became known to Cyril. Against him Cyril taught the use of the term Theotokus in his Paschal letter for 429 and in a letter to the monks of Egypt. A correspondence with Nestorius followed, in a more moderate tone than might have been expected. Nestorius sent his sermons to Pope Celestine, but he received no reply, for the latter wrote to St. Cyril for further information. Rome had taken the side of St. John Chrysostom against Theophilus, but had neither censured the orthodoxy of the latter, nor consented to the patriarchal powers exercised by the bishops of Constantinople. To St. Celestine Cyril was not only the first prelate of the East, he was also the inheritor of the traditions of Athanasius and Peter. The pope's confidence was not misplaced. Cyril had learnt prudence. Peter had attempted unsuccessfully to appoint a Bishop of Constantinople; Theophilus had deposed another. Cyril, though in this case Alexandria was in the right, does not act in his own name, but denounces Nestorius to St. Celestine, since ancient custom, he says, persuaded him to bring the matter before the pope. He relates all that had occurred, and begs Celestine to decree what he sees fit (typosai to dokoun--a phrase which Dr. Bright chooses to weaken into "formulate his opinion"), and communicate it also to the Bishops of Macedonia and of the East (i.e. the Antiochene Patriarchate). The pope's reply was of astonishing severity. He had already commissioned Cassian to write his well known treatise on the Incarnation. He now summoned a council (such Roman councils had somewhat the office of the modern Roman Congregations), and dispatched a letter to Alexandria with enclosures to Constantinople, Philippi, Jerusalem, and Antioch. Cyril is to take to himself the authority of the Roman See and to admonish Nestorius that unless he recants within ten days from the receipt of this ultimatum, he is separated from "our body" (the popes of the day had the habit of speaking of the other churches as the members, of which they are the head; the body is, of course the Catholic Church). If Nestorius does not submit, Cyril is to "provide for" the Church of Constantinople. Such a sentence of excommunication and deposition is not to be confounded with the mere withdrawal of actual communion by the popes from Cyril himself at an earlier date, from Theophilus, or, in Antioch, from Flavian or Meletius. It was the decree Cyril has asked for. As Cyril had twice written to Nestorius, his citation in the name of the pope is to be counted as a third warning, after which no grace is to be given. St. Cyril summoned a council of his suffragans, and composed a letter which were appended twelve propositions for Nestorius to anathematize. The epistle was not conciliatory, and Nestorius may well have been taken aback. The twelve propositions did not emanate from Rome, and were not equally clear; one or two of them were later among the authorities invoked by the Monophysite heretics in their own favour. Cyril was the head of the rival theological school to that of Antioch, where Nestorius had studied, and was the hereditary rival of the Constantinopolitan would-be patriarch. Cyril wrote also to John, Patriarch of Antioch, informing him of the facts, and insinuating that if John should support his old friend Nestorius, he would find himself isolated over against Rome, Macedonia, and Egypt. John took the hint and urged Nestorius to yield. Meanwhile, in Constantinople itself large numbers of the people held aloof from Nestorius, and the Emperor Theodosius II had been persuaded to summon a general council to meet at Ephesus. The imperial letters were dispatched 19 November, whereas the bishops sent by Cyril arrived at Constantinople only on 7 December. Nestorius, somewhat naturally, refused to accept the message sent by his rival, and on the 13th and 14th of December preached publicly against Cyril as a calumniator, and as having used bribes (which was probably as true as it was usual); but he declared himself willing to use the word Theotokos. These sermons he sent to John of Antioch, who preferred them to the anathematizations of Cyril. Nestorius, however, issued twelve propositions with appended anathemas. If Cyril's propositions might be might be taken to deny the two natures in Christ, those of Nestorius hardly veiled his belief in two distinct persons. Theodoret urged John yet further, and wrote a treatise against Cyril, to which the latter replied with some warmth. He also wrote an "Answer" in five books to the sermons of Nestorius. As the fifteenth-century idea of an oecumenical council superior to the pope had yet to be invented, and there was but one precedent for such an assembly, we need not be surprised that St. Celestine welcomed the initiative of the emperor, and hoped for peace through the assembly. (See EPHESUS, COUNCIL OF.) Nestorius found the churches of Ephesus closed to him, when he arrived with the imperial commissioner, Count Candidian, and his own friend, Count Irenaeus. Cyril came with fifty of his bishops. Palestine, Crete, Asia Minor, and Greece added their quotient. But John of Antioch and his suffragans were delayed. Cyril may have believed, rightly or wrongly, that John did not wish to be present at the trial of his friend Nestorius, or that he wished to gain time for him, and he opened the council without John, on 22 June, in spite of the request of sixty-eight bishops for a delay. This was an initial error, which had disastrous results. The legates from Rome had not arrived, so that Cyril had no answer to the letter he had written to Celestine asking "whether the holy synod should receive a man who condemned what it preached, or, because the time of delay had elapsed, whether the sentence was still in force". Cyril might have presumed that the pope, in agreeing to send legates to the council, intended Nestorius to have a complete trial, but it was more convenient to assume that the Roman ultimatum had not been suspended, and that the council was bound by it. He therefore took the place of president, not only as the highest of rank, but also as still holding the place of Celestine, though he cannot have received any fresh commission from the pope. Nestorius was summoned, in order that he might explain his neglect of Cyril's former monition in the name of the pope. He refused to receive the four bishops whom the council sent to him. Consequently nothing remained but formal procedure. For the council was bound by the canons to depose Nestorius for contumacy, as he would not appear, and by the letter of Celestine to condemn him for heresy, as he had not recanted. The correspondence between Rome, Alexandria, and Constantinople was read, some testimonies where read from earlier writers show the errors of Nestorius. The second letter of Cyril to Nestorius was approved by all the bishops. The reply of Nestorius was condemned. No discussion took place. The letter of Cyril and the ten anathemaizations raised no comment. All was concluded at one sitting. The council declared that it was "of necessity impelled" by the canons and by the letter of Celestine to declare Nestorius deposed and excommunicated. The papal legates, who had been detained by bad weather, arrived on the 10th of July, and they solemnly confirmed the sentence by the authority of St. Peter, for the refusal of Nestorius to appear had made useless the permission which they brought from the pope to grant him forgiveness if he should repent. But meanwhile John of Antioch and his party had arrived on the 26th and 27th of June. They formed themselves into a rival council of forty-three bishops, and deposed Memnon, Bishop of Ephesus, and St. Cyril, accusing the latter of Apollinarianism and even of Eunomianism. Both parties now appealed to the emperor, who took the amazing decision of sending a count to treat Nestorius, Cyril, and Memnon as being all three lawfully deposed. They were kept in close custody; but eventually the emperor took the orthodox view, though he dissolved the council; Cyril was allowed to return to his diocese, and Nestorius went into retirement at Antioch. Later he was banished to the Great Oasis of Egypt. Meanwhile Pope Celestine was dead. His successor, St. Sixtus III, confirmed the council and attempted to get John of Antioch to anathematize Nestorius. For some time the strongest opponent of Cyril was Theodoret, but eventually he approved a letter of Cyril to Acacius of Berhoea. John sent Paul, Bishop of Emesa, as his plenipotentiary to Alexandria, and he patched up reconciliation with Cyril. Though Theodoret still refused to denounce the defence of Nestorius, John did so, and Cyril declared his joy in a letter to John. Isidore of Pelusium was now afraid that the impulsive Cyril might have yielded too much (Ep. i, 334). The great patriarch composed many further treatises, dogmatic letters, and sermons. He died on the 9th or the 27th of June, 444, after an episcopate of nearly thirty-two years.